With over 90 attorneys, GableGotwals has announced the promotion of one associate attorney and three of counsel attorneys to shareholder status. 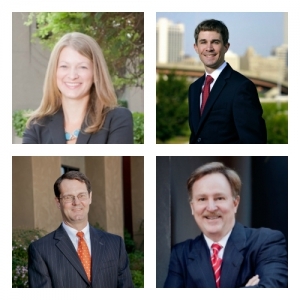 The new shareholders include Sara Barry, Brandon Bickle, and Philip Hixon who are located in Tulsa and Leo Portman who practices in Oklahoma City. The Firm now has offices in Tulsa, Oklahoma City and San Antonio, Texas. Sara E. Barry counsels clients on corporate formations and reorganizations, contract review, mergers and acquisitions, real estate transactions and estate planning. Her areas of focus include Corporate and Business Organizations, Commercial Law, Mergers and Acquisitions, Securities and Corporate Finance, Trusts and Estates, Employee Benefits and Real Estate. Sara was named a Rising Star by Super Lawyers in 2008. Brandon C. Bickle regularly advises clients on a variety of business matters, including contract and loan disputes, construction disputes, collections, loan workouts, and bankruptcy matters. Brandon’s practice is focused broadly in the area of general commercial litigation, with an emphasis on collections, foreclosures, and bankruptcy. Brandon has been named a Rising Star by Super Lawyers in the areas of Business Litigation and Bankruptcy & Creditor/Debtor Rights. Philip D. Hixon represents the interests of clients in a variety of legal matters including construction, environment, insurance, health care, general litigation and appellant review of the same. Philip is an AV Preeminent attorney with Martindale-Hubbell and a Super Lawyers Rising Star. He currently serves as co-chair of the Health Law section for the Tulsa Count Bar Association. Leo J. Portman, an Oklahoma City attorney, brings over thirty years of experience to GableGotwals in the areas of title examination and oil and gas law. He also practices in the areas of corporate liquidation, wealth management for families and businesses, and with business management and asset transactions. With over 30 years practicing law, Leo is well known in the legal and civic communities for his leadership in a variety of private and not-for-profit organizations.